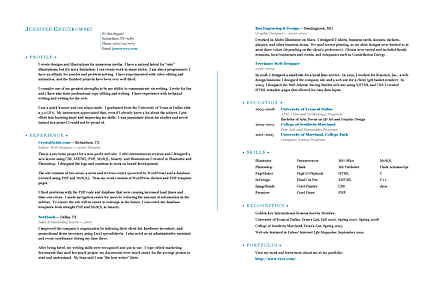 I decided the time had come for me to redesign my resume. This is no little change; it’s a complete overhaul. 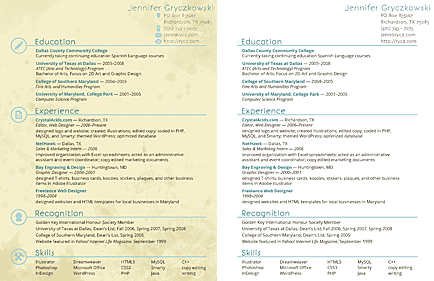 I shortened my resume down to one page and created two versions of it: the first version is very visual, with a background and icons; the second version has neither a background nor icons, so it uses less ink if printed. The colour palette is made up of two shades of blue and three shades of brown. Even the body text is a dark brown colour. My original resume was two pages long. For my new one, I cut out the profile and I shortened my experience information to a few main points. Should I have kept in that I graduated with a 3.9 GPA? It’s hard to say what counts as essential information in a resume. I’ve seen people include how much coffee they drink. I did add that I’m currently taking Spanish language courses to further my education. Being able to speak Spanish is important, especially in a city like Dallas. I also updated my LinkedIn profile to include a more comprehensive list of skills and some of my college courses.